He was born in York County, Ontario. He had one daughter. He was educated at Richmond High School and graduated from the University of Toronto in 1878. He was called to the Bar in 1881. In 1882 he came west and practised law in Brandon until 1887, when he moved to Winnipeg to work with a trust company. At his death he was manager of the Standard Trust Company. He served on the Brandon School Board. He was elected a Winnipeg Alderman in 1902. 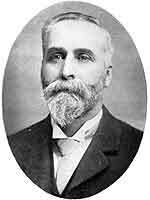 In 1904 he was chairman of the finance committee, and in 1905 chairman of the legislation committee. He was a president of the Winnipeg Board of Trade and of the St. Andrew’s Society. Russell died in Winnipeg in May 1905.